Last week I was sitting at dance class when I got an email from a blog reader asking if we'd like to go see a NASCAR race that upcoming weekend. We'd never been and it sounded fun so I responded with a resounding, YES! My kids were PUMPED and we spent a fair amount of time googling, watching videos and getting excited! Amanda (who works for NASCAR) was SO GRACIOUS and got us some amazing passes that allowed us in the pits and garage areas before as well as during the race. When we got off the shuttle in the infield, Steph (another amazing NASCAR employee) was there to meet us and show us around which I was SO GRATEFUL for since we had no clue what we were doing ;) Our first stop was the garage area where we got to see all of the cars that had been inspected and were almost on a "lock down" of sorts waiting to get brought out to the track. Steph was a WEALTH of knowledge about all things racing and really gave us a great peek into the cars, drivers and alllll the things that go into getting the cars to the track. My kids were most impressed with the trailers (that house all the tools as well as two race cars!) and then pretty much turn into a meeting area/lounge and I couldn't get over hearing about all the engineering/technology involved in getting the cars ready and inspected. It was SO MUCH MORE than I ever imagined and was really cool to learn about. 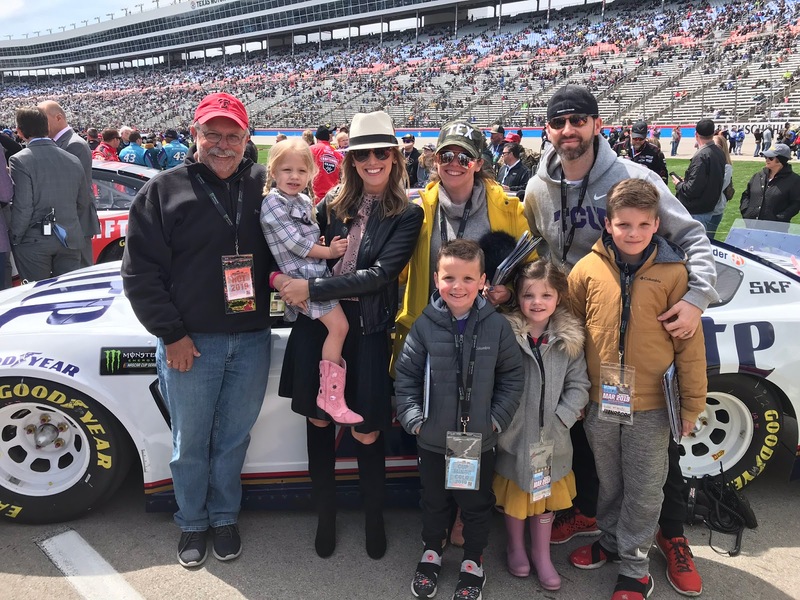 ... and then we made our way out onto the track to meet Amanda's husband who is one of the mechanics on the Number 1 team. ... which is where the winner of the race gets the trophy and all the hoopla happens after the race. Next, Steph told us we were going to walk over to where the drivers were going to be introduced... and we found ourselves following her down the path where the drivers walk to get to the stage. The kids had picked up these driver "cards" while we were walking through the garage area and they had those as well as a big program book ready to get signed. Steph was so sweet and she would tell the kids who the drivers were as they were walking toward us so that they could yell their name and get them to sign their books. Next, Steph told us that we were going to go meet the wife and daughter of one of the drivers and she gave my kids an up close look at his car. Our passes allowed for us to watch the race from Pit Road but since the kids were under 18 and couldn't be down there during the race we opted to watch from the grandstands instead so they could get a "big picture" feel for what was happening. Despite leaving our ear protecting headphones at home (MOM FAIL!) they completely and totally LOVED IT! We watched for a while, grabbed some food, watched a bit more and then headed home to finish watching the race on TV. - Never have I EVER been to a sporting event where the people were as nice as they were at this race. From the pit crew members, to the drivers, to the fans... everyone was SO KIND! - It was LOUD! If you're headed to a race make sure you bring your own protective headphones! After leaving ours at home we tried to rent sets but the line was FOREVER long. The ear plugs were helpful but didn't really cut down on the noise that much. The whole experience was SO MUCH FUN and not something that I had on my bucket list or radar for activities but something we'd totally go back and do again. Like I said above, everyone was SO NICE and gracious and it was such a memorable day for all of us! I completely agree, there is no kindness like NASCAR fans and crew kindness. And I agree, it's soooooo loud. We used to live "somewhat" (keyword: somewhat) near the Kansas track and you could hear the engines for miles and miles even though we weren't that close. I am so glad you had a great time! What a fun surprise for your family, definitely a memory that will last forever. PS: I still freak out when my wedding band gets stuck on my finger. Like literally chest tightening scared. I can't imagine looking down at the lug nut stuck on his finger! I could have a panic attack at the finger thing right now. So glad you got it off!!!! Looks like such a fun day! I completely understand panicking about the finger thing... i keep hand lotion on my bag for that same reason!!!!! Looks like y'all had a fun day! Wow! I am so intrigued by all of this! What a cool experience!!! My son and 6-yr-old grandson were at the race. My grandson would be super jealous if your kids had Kyle Busch's autograph. He could tell you more facts about that race than you ever wanted to know. :) My son had purchased the ear protectors you had bought (or at least they look the same) and taken them, but opted to rent the ones from the track because they could communicate with each other, as the track set had microphones. That is his tip for next time you go. So glad you enjoyed the race! Although, I am a little jealous of your pit passes. I am a huge NASCAR fan being from North Carolina and have been to many races. We are actually going to the Bristol race this weekend. My husband is REALLY into cars, so I have been to a few racing events, but never Nascar! So cool that you all got to go and glad you had such a great time! So fun! What a cool experience for all of you!